Louis Ray Talley, 74, of Splendora, Texas passed away on Monday, September 10, 2018. He was born on June 28, 1944, in Houston, Texas. Louis had a great love for the outdoors. 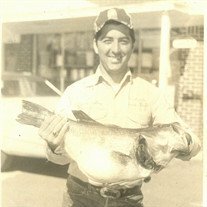 He was an expert trapper, fisherman and deer hunter. He left this legacy to his children and grandchildren. Louis was a devout Christian; firm in his faith to God and a missionary to many throughout his life. He is preceded in death by his parents, Cecil Ray Talley and Calmes Lazelle (Baucom) Talley. Left to cherish his memory are his loving sons; Clint Talley and his wife Rene', Bobby Talley and his wife Debbie, daughter; Lori Kaldschmidt and her husband Axel, grandchildren; Rachel Hanus and husband Travis, Chris Talley, Alex Kaldschmidt, Lily Kaldschmidt, Brandi Brown and husband Heath, Bodan Faulkner, great-grandchildren; Morgan, Brendan, Kaesyn and Rhett, along with numerous other loving family and treasured friends. Visitation for Louis will be held at Neal Funeral Home on Friday, September 14, 2018, from 1:00 p.m. to 2:00 p.m. Funeral Services for Louis will commence at 2:00 p.m.
Interment for Louis will immediately follow at Securtiy Cemetery.